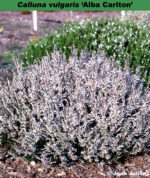 Lavender (H3) flowers, VII–VIII; grey-green foliage; spreading habit; height 26–30cm; spread 46–60cm. Introduced in Canada before 1972 by William (Bill) Goddard (Flora Vista Gardens, Victoria, British Columbia). ♤ Purple-red buds (smaller than 'Marleen'), IX–XI; mid-green foliage; broad spreading, upright habit, height 26–30cm; spread 46–60cm. Wild-collected; found on Ginkelse Heide between Ede and Wageningen, near Arnhem, Netherlands, by Dr Ir T. Visser (Wageningen, Netherlands); introduced by W. Haalboom & Zonen (Driebergen, Netherlands) in 1974. Named after Adrie Hoogerdijk-Haalboom, Mr Haalboom's daughter (Ericultura 60: 12 (1986)). ♤ Bud-flowering; small buds, densely covered, healthy and vigorous; red purple; IX-XI; foliage green; habit upright; height 50cm; spread 50cm after 3 years (not pruned). Deliberately raised cross by J. van Leuven, made in 2010 between unnamed seedlings, selected in September 2011; for introduction in 2015. ® C.2013:05 registered on 25 October 2013 by J. van Leuven, Geldern-Lüllingen, Germany. ♤ Light purple (H10) bud-bloomer; IX-XI(XII); foliage dark green; habit bushy, compact, height 15cm; spread 20cm. Wild-collected: found by Kurt Kramer in 1995 near Ahrensdorf. Registered on 25 July 2003 by Kurt Kramer. White-flowered C. vulgaris has been known for at least four centuries. When used as a cultivar name 'Alba' may cover many different clones; C. vulgaris f. alba is a better name for these plants. It was first reported in the wild in Britain in John Gerard's The Herball in 1597. Named after albus = white; the flower colour. White flowers, VIII–IX; mid-green foliage tipped white in spring; height 26–30cm; spread 31–45cm. White flowers, VIII–X, bright green foliage with lemon tips particularly in spring and autumn; height 10–15cm; spread 21–25cm. J. Smith (Darley Dale) listed this as early as 1868; The Lawson Seed & Nursery Co. (Edinburgh, Scotland) listed it in 1874 (as 'Albo Aurea'). Named from albus = white; after the flower colour: aureus = golden yellow; after the foliage colour. Silvery white flowers, even on all lateral shoots, VIII–IX; distinctive dark green foliage; broad spreading upright habit; height 21–25cm; spread 31–45cm. Probably wild-collected sport; found by F. S. H. Ward (Malton, North Yorkshire, England); introduced by Maxwell & Beale (Broadstone, Dorset) in 1937. White flowers, VII–IX; light green foliage;road spreading habit; height 31–45cm; spread 31–45cm. Named from albus = white; a reference to flower colour; dumosus = bushy habit. White flowers, VIII–X; mid-green foliage; height 46–60cm; spread 61–75cm. An outstanding plant. Named from albus = white; a reference to flower colour; elatus = tall. White flowers, VIII–IX; mid-green foliage; rather open habit; height 31–45cm; spread 61–75cm. White flowers, VIII–IX; mid-green foliage; attractive upright habit; height 26–30cm; spread 46–60cm. Named after albus = white; a reference to flower colour; erectus = erect. White flowers, VII–VIII, bright green foliage with yellowish tips retained for most of the year; height 26–30cm; spread 31–45cm. Seedling; found by F. J. Chapple in his garden at Whaley Bridge, Derbyshire, England, about 1950. Jae was the nick-name of Mrs Jessie Chapple. White flowers for a long period, VII–IX; bright green foliage; height 10–15cm; spread 21–25cm. White flowers, IX–X; mid-green foliage; upright habit; height 46–60cm; spread 46–60cm. White flowers, VIII–IX; hairy mid-green foliage. Upright habit. Introduced before 1868; height 21–25cm; spread 46–60cm. ❁ Double white flowers, VIII–X, with mid-green foliage; height 26–30cm; spread 31–45cm. Wild-collected; a sport on a white-flowered plants (C. vulgaris f. alba); found near Oldenburg, Germany, by A. Lamken (Giesselhorst, Germany) in 1934; introduced by 1938. But this was listed as early as 1864 by André, and as early as 1805! Johnson (1950) stated "A curious feature of this novelty is that the first flowers to appear are singles and it is not until their season has advanced a few weeks that they assume their true character." Named from albus = white; a reference to flower colour; plenus = full (i.e. double). White flowers, VI–VIII; mid-green foliage; neat upright habit; height 26–30cm; spread 46–60cm. Seedling; found by Georg Arends (Wuppertal, Germany); introduced by Arends in 1938. Named from albus = white; a reference to flower colour; praecox = early, precocious, a reference to the flowering season. White flowers, VIII–IX; mid-green foliage; neat, dwarf habit; height 10–15cm; spread 26–30cm. White flowers, VII–VIII; bright green foliage; distinctive, close intricate habit; height 10–15cm; spread 26–30cm. 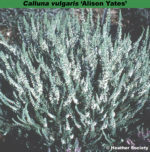 Sport on Calluna 'Rigida'; introduced before 1867 when it was listed by James Smith (Darley Dale, Derbyshire, England). Named from albus = white; a reference to flower colour; rigidus = rigid, stiff. ❁ Double white flowers, VIII–XI (lasting longer than 'Kinlochruel'); dark green foliage; dome-like habit; height 16–20cm; spread 31–45cm. White flowers, VI–VII; mid-green foliage; height 10–15cm; spread 31–45cm. Wild-collected (collector's no. K60); found on St Kilda by R. J. Brien (Pitcairngreen Heather Farm, Perthshire, Scotland) in 1967; introduced in 1971 by The Scottish National Trust. One of several clones collected from St Kilda. Named after the founder of the St Kilda Club. ♤ Bi-coloured white/crimson buds which darken with age to a uniform deep crimson, VIII–XII; dark green foliage; upright, bushy habit; height 26–30cm; spread 31–45cm. More compact and darker than 'Marlies'. Seedling; raised by Kurt Kramer (Edewecht, Germany) about 1991; introduced by Kramer in 1993; submitted originally for plant breeders' rights in Germany on 15 May 1992; rights granted for EU on 15 October 1996 (EU-2017). Named by Kurt Kramer after a famous German singer, Doris Nefedov (née Treitz; 1942–1969) a popular Lithuanian-born singer and songwriter, who used the stage-name Alexandra; she and her mother were killed at the end of July 1969 in an unexplained collision between their car and a truck. Lavender flowers, VIII–IX; gold foliage in summer turning orange in winter; upright habit; height 31–45cm; spread 46–60cm. Seedling; raised at Heather Acres (Elma, Washington, USA); selected by Pat Cullers and Karla Lortz, and introduced in 1998 at Northwestern Flower and Garden Show, Seattle, by Heaths & Heathers (Shelton, Washington, USA). Named in honour of Alice Knight, a founding member of the North American Heather Society. ♤ White buds, surviving for a long period, VIII–XII; bright green foliage; compact upright habit; height 26–30cm; spread 31–45cm. It has larger buds which last longer and has a less floppy habit than 'Melanie'. A seedling from the deliberate cross made by Kurt Kramer between 'Marleen' and 'Long White'. Mauve flowers, IX–X; yellow orange foliage throughout the year; low compact habit; height 10–15cm; spread 26–30cm. A Dutch introduction. Seedling; found by M. van de Berg (Bennekom, Netherlands) by 1987; introduced by G. van Hoef (Barneveld, Netherlands) by 1990. Named after the finder's grand-daughter. ♤ Red buds, IX–XII; orange-yellow foliage in summer turning bronze in winter; broad spreading, upright habit; height 26–30cm; spread 46–60cm. Long spikes of white flowers, IX–X; silver–grey foliage; vigorous but compact habit; height 31–45cm; spread 46–60cm. Seedling; found at and introduced by Tabramhill Gardens (Newstead Abbey Park, Nottinghamshire, England) in 1973. Named after the daughter of Geoffrey Yates, the introducer. ❁ double mauve flowers; VII-X; foliage gold green with orange tints; height 25cm; spread 30cm. Sport of 'Tib' from Ken Hutchins. Named after Ken Hutchins's daughter. ® C.2008:02 registered on 24 January 2008 by K. Hutchins, Mossyrock, WA, USA. Long spikes of ruby (H5) flowers, VIII–IX; greenish yellow foliage turning bronze in winter; broad, erect habit; height 46–60cm; spread 46–60cm. Winner of a Silver Medal at Boskoop, Netherlands, in 1983. Sport on 'Allegro'; introduced by P. Bakhuyzen & Zonen (Boskoop, Netherlands) in 1981. Named from an allusion to its parent, 'Allegro'. Ruby (H5) flowers, VIII–X; dark green foliage; vigorous yet neat; height 46–60cm; spread 46–60cm. Winner of a Gold Medal winner at Boskoop, Netherlands, in 1978. Flowers solitary on side shoots, buds pink (H8), opening shell-pink (H16); calyx lobes about 3.5mm long, broad; corolla lobes shorter, c. 3mm; foliage individual leaves less than 1mm long, mid-green, glabrous; very tightly appressed to slender and short (about 1cm long, not more than 1mm wide) side shoots, which are often not branched – the effect is of a mossy shrub; shoots tips paler, yellow-green when young. Seedling deliberately raised and selected in 2006 by Sten-Börje Sörensson; Ally was his mother’s second name. ® C.2011:08 registered on 16 September 2011 by Sten-Börje Sörensson, Hono, Sweden. Crimson (H13) flowers, VII–IX; dark green foliage; more compact habit than 'Alportii'; height 31–45cm; spread 31–45cm. Outstanding. German introduction. Seedling from 'Alportii'; found by Georg Arends (Wuppertal, Germany); introduced by Arends in 1938. Crimson (H13) flowers, VIII–IX; dark green foliage; upright habit; height 31–45cm; spread 46–60cm. The garden 20: 203 (27 August 1881) refers to Alport's Heather ('the colour so deep ...); introduced before 1852, and stated to have come from England (Kirchner 1864); listed by James Smith in 1867, and by Lawson (Edinburgh, Scotland) in 1874. Name derivation not known, but assumed to refer to someone name Alport, but no-one with that name is on record. A possibility is that the name should be Allportii, after a family of nurserymen (fl 1800s) of Hackney Road, Shoreditch, London. Bright mauve (H2) flowers, VIII–IX; dark green foliage; neat, prostrate habit; height 10–15cm; spread 26–30cm. Seedling; selected and named before 1965, presumably at Brooklyn Botanic Garden, USA. Named after an English horticulturist who worked at Brooklyn Botanic Garden, USA, 1954–1969. ♤ Bud-flowering, ruby (H5; RHS 59B–60A), darker than ‘Amethyst’; VIII-IX; foliage dark green, new growth mid-green; height 30cm; spread 25cm after 3 years (pruned). Sport from ‘Amethyst’ found in Autumn 1999 at Apen, Germany, in nursery of Marohn & Häger. ® C.2011:05 registered on 12 February 2011 by Kurt Kramer, Edewecht, Germany. Lilac pink (H8/H11) flowers, VII–X; orange foliage; Upright habit; height 31–45cm; spread 46–60cm. ♤ Purplish crimson buds, VIII–I; dark green foliage; Upright bushy habit; height 26–30cm; spread 31–45cm. A selection made by Kurt Kramer with buds which are bluer than 'Alexandra' and which last longer. Deep magenta (H14) flowers, VIII–IX; yellow foliage in summer turning bronze to orange-red in winter; young shoots bronze-yellow; broad upright habit; height 31–45cm; spread 46–60cm. Very hardy and requires a harsh environment for maximum foliage colour. Corolla heliotrope (H12); flowers on rust-red pedicels, single; VIII-IX; foliage lime-green with more yellow tips, turning bronze-yellow in Autumn; habit low, dense, spreading; 20cm tall, 50cm broad after 5 years because each shoot (even flowering ones) curves downwards; it does not need pruning. Very hardy. Chance seedling found in a pot containing a "big Arran Gold' ... used as a mother plant to take cuttings from"; found at Glimakra, about 2000. ® C.2006:02 registered on 2 January 2006 by Torgny Karlsson, Glimakra, Sweden. Small lilac–pink (H11) flowers, VIII–IX; orange-tipped, light yellow foliage with bronze and red tints in winter; height 10–15cm; spread 21–25cm. 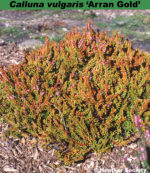 Possibly a seedling from 'Lyndon Proudley'; found in a pot of 'Lyndon Proudley' by B. and V. Proudley (St Briavels, Gloucestershire, England); introduced by Foxhollow Heathers (St Briavels) in 1971. Named after one of the Proudleys' sons (see Calluna vulgaris 'Lyndon Proudley'). ♤ Clear pink buds, VIII–XI; mid-green foliage; erect habit; height 31–45cm; spread 31–45cm. The buds retain their colour well when dried making it ideal for flower arranging. This outstanding introduction is also ideal for late autumn and early winter use in window-boxes or tubs. White flowers, VIII–IX; grey-green foliage; semi–prostrate with curling stems; height 21–25cm; spread 31–45cm. Seedling; found by Mr & Mrs Wain in their nursery at Burton-under-Needwood, Staffordshire, England, before 1983; introduced by Twin Acre Nursery (Knutsford, Cheshire). Named after the raisers' daughter. ♤ Bud-flowering; corolla and calyx dark red; buds medium-sized; IX-XII; foliage dark green; habit upright, after 5 years 60cm tall, 50cm across. Sport on 'Moulin Rouge', found by Johannes van Leuven un September 2003. Named after the German Chancellor (Bundeskanzlerin), Angela Merkel. ® C.2005:04 registered by Johannes van Leuven, Geldern-Lüllingen, Germany. ♤ Bud-bloomer; rose-pink; IX-XI; foliage bright green; habit upright. Chance seedling found in September 2001; selected by Johannes van Leuven. Submitted for plant breeders' rights in October 2001 in Germany; Registered on 2 January 2003 by Johannes van Leuven. Named by J. van Leuven after his god-daughter. White flowers, VIII–IX; golden yellow foliage throughout the year; narrow erect habit; height 21–25cm; spread 31–45cm. 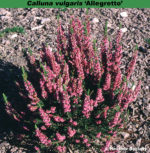 Sport on Calluna vulgaris 'Fairy'; found by Frau Anna Kramer (Edewecht-Süddorf, Germany); introduced by Kurt Kramer in 1978. Named after Frau Anna Kramer, mother of K. Kramer (nurseryman and hybridiser). ❁ Double rose-red flowers, IX–X; dark green foliage; upright habit; height 46–60cm; spread 61–75cm. A sport on 'Annemarie' found by Kurt Kramer; it blooms 2–3 weeks earlier. 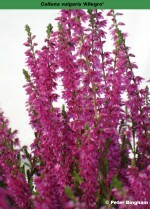 Pink flowers, VIII–X; dark green foliage; minute, prostrate plant; height 10–15cm; spread 26–30cm. Named after the grand-daughter of Eileen Porter. White flowers, VII–VIII; yellow-green foliage throughout the year; upright habit; height 31–45cm; spread 46–60cm. Flowers normal, sepals and petals lavender, to 3mm long, anthers brown; VIII-IX; foliage yellow in summer, tinted orange in winter; habit trailing/weeping; height 3cm; spread trailing stems to 24cm long after 3 years. Sport on ‘Annes zwerg’ in 2006 at Forest Edge Nurseries, Wimborne. ® C.2010:04 registered on 7 September 2010 by David Edge, Wimborne, Dorset. Flowers reddish purple; VIII-IX; similar to 'Heidezewerg' in habit but grows more slowly and is more compact; height 10–15cm; spread 21–25cm. Found by Anne Biermann (Edewecht, Germany) about 1995 in the wild near Meppen, north-west Germany. Named after the finder, Anne Biermann. ® C.2008:03 registered by Kurt Kramer, Edewecht, Germany. Crimson (H13) flowers, IX–X; mid-green foliage; spreading branches which are recurved when young; height 26–30cm; spread 31–45cm. Seedling; found by D. Cox at Goscote Nurseries (Cossington, Leicestershire, England) in September 1979; introduced by Goscote Nurseries in 1983. Named after one of the workers. Crimson (H13) flowers in short spikes, VIII–IX; green foliage; very compact habit; height 16–20cm; spread 21–25cm. Seedling; found by H. Hoekert (Oldebroek, Netherlands) in 1979; introduced by Hoekert by 1983. Named after Anton Jansman, Hoekert's nursery foreman. White flowers, VII–IX; bright yellow foliage throughout the year; broad, upright habit; height 31–45cm; spread 31–45cm. A sport from 'Boskoop', found in the Netherlands. The name is a combination of Anja, Truus and Johan, children of the finder. ♤ Deep red buds, VIII–I; dark green foliage; upright bushy habit; height 26–30cm; spread 31–45cm. CLL 100; sport on 'Amethyst'; submitted for plant breeders' rights in Germany by Kurt Kramer (Edewecht-Süddorf, Germany) on 1 April 1998; EU pbrights granted 15 January 2001 (grant no. 6859; file no. 1999/0040). Named after the Greek goddess. Preliminary designation (vorläufige Bezeichnung) was "rote Amethyst". Pink (H8) flowers, VIII–IX; bright yellow foliage; upright habit; height 31–45cm; spread 46–60cm. Recommended. One of a number of good introductions by Broadhurst Nursery, Cornwall. ❁ Double rose-pink (H7) flowers, IX–X, with dark green foliage; height 46–60cm; spread 46–60cm. Daintier in appearance and paler than 'Peter Sparkes'. Wild-collected; found by by J. Mair (Bearsden, Strathclyde) at Applecross, Ross-shire, Scotland in 1971; introduced by P. G. Zwijnenburg (Boskoop, Netherlands) before 1980. Brilliant blood-red flowers in profusion, VIII–IX; dark green foliage; open erect habit; height 26–30cm; spread 31–45cm. The flower-colour is similar to 'Dark Beauty'. Introduced by Kurt Kramer (Edewecht-Süddorf, Germany) before 1995. Clone CLL 19; submitted for plant breeders' rights on 27 August 1993; rights granted in Germany on 31 March 1995; EU rights granted 15 October 1996. Mauve (H2) flowers, VIII–IX; bright green foliage particularly in spring [foliage being whitish at the tips during the summer, and, if anything, a shade more so in winter. '; height 16–20cm; spread 31–45cm. Mentioned in a sample book at the Royal Botanic Gardens, Kew, with a fly-leaf note "William Cripps, Tooting Nurseries [London, England] 11th April 1849"; listed by James Smith in 1867 and by Lawson (Edinburgh, Scotland) in 1874. Lavender flowers, VIII–IX; bright gold foliage in summer turning red and bronze in winter; vigorous upright habit; height 31–45cm; spread 46–60cm. Seedling; found by J. N. Anderson in Broadhurst Nursery (Grampound, near Truro, Cornwall, England); introduced by J. N. Anderson before 1982. A classical name, chosen at random, but also the named of the raiser's cat. Lilac pink (H11) flowers, VII–VIII; mid-green foliage, tipped orange and cream in spring; erect habit; height 31–45cm; spread 46–60cm. One of the earlier spring-foliage Calluna to show colour. Introduced by Darthuizer Boomkwekerijen, Leersum, Netherlands, in 1972. Mauve (H2) flowers, VII–VIII; superb gold foliage in summer, turning lime-green flecked with red in winter; height 10–15cm; spread 21–25cm. Wild-collected; found on Beinn Nuis, Isle of Arran, Scotland, by Roger Bell; introduced by D. Hutton (Aberfoyle, near Callander, Perthshire, Scotland) by 1971. Named after the island in the Firth of Clyde where it was found; gold alludes to the summer foliage. Amethyst (H1) flowers, VIII–IX; gold foliage in summer deepening to red in winter; broad spreading habit; height 21–25cm; spread 31–45cm. Purple (H10) flowers, VIII–IX; dark green foliage; semi-prostrate habit with the young shoots curling back; height 21–25cm; spread 31–45cm. Pink (H8) flowers, VIII–IX; mid-green foliage; semi-dwarf, compact habit; height 10–15cm; spread 31–45cm. Seedling; found by Horace ("Papa") Hale at Ashgarth, Haslemere, Surrey, England, in 1967; introduced by P. G. Davis (Haslemere) by 1969. Ashgarth was the name of H. Hale's house; and the colour of the flowers. ♤ Bud-flowering (Knospenblüher), white, VIII-X; foliage: silvery green; habit: upright, bushy, to 50cm × 50cm after 4 years (pruned). Buds relatively large, pure white; early blooming and long-lasting; very vigorous. A deliberately raised seedling (VL 11-00012); cross made in 2010; selected in September 2011 by J. van Leuven. ® C.2017:01 registered on 20 June 2017 by J. van Leuven, Geldern-Lüllingen, Germany. Pale mauve (H2) flowers, VIII–X; mid-green foliage; generally prostrate habit with erect stems; height 10–15cm; spread 31–45cm. A seedling found in the grounds of a clinic at Bennekom, Ede, Netherlands, by A. van de Berg and named after one of the buildings at the clinic. Lilac pink (H11) flowers, VIII–IX; golden foliage turning pale orange in spring; broad habit; height 31–45cm; spread 46–60cm. Recommended. Seedling; found by J. N. Anderson in Broadhurst Nursery (Grampound, near Truro, Cornwall, England) before 1979; introduced by J. N. Anderson in 1980. A classical name, chosen at random. ♤ Corolla red, calyx dark red buds; IX-XI; foliage dark green. Sport on 'Amethyst' found by Wilfried Holzwart, Hoisdorf, Germany, on 23 September 2002 at Betrieb Holzwart. Named after the Greek goddess Athene. Registration no. C01:2004: registered on 19 February 2004 by Kurt Kramer, Edewecht, Germany. Mauve (H2) flowers, VIII–IX; gold foliage in summer becoming more brilliant in winter, taking on tints of red, orange and bronze; upright habit; height 31–45cm; spread 46–60cm. Introduced before 1987, by Ardfern Nursery (Inverness, Scotland)? Named after an area in central Perthshire, Scotland. Free-flowering, white, VIII–IX; mid-green foliage; open erect habit; height 31–45cm; spread 31–45cm. Mauve (H2) flowers, VIII–IX; gold foliage in summer and copper-red in winter; height 16–20cm; spread 31–45cm. ♤ White buds; IX-XII; foliage gold; habit broad and upright; height 40cm; spread 60cm after 3 years (not pruned). Better growth than 'Sandy'; less buds, upright. Chance sport from ‘Sandy’ found in October 2010 at Geldern by Johannes van Leuven; to be released in 2015. ® C.2013:03 registered on 25 October 2013 by J. van Leuven, Geldern-Lüllingen, Germany. ❁ Double rose-pink flowers, VIII–X; mid-green foliage; height 21–25cm; spread 31–45cm. Gold medal at BUGA, Potsdam, 2001.